A second video showing Baltimore cops manufacturing evidence has been discovered and it's already prompted another dropped case. Last week, it was announced that nearly three dozen people will have their charges dropped after the video of Officer Richard Pinheiro showed him planting drugs while Officers Hovhannes Simonyan and Jamal Brunson stood by and did nothing. Following the public release of the video, 34 cases were immediately dismissed that relied on the testimony of Pinheiro, Simonyan and Brunson. Baltimore State’s Attorney Marilyn J. Mosby noted that just 12 of the cases have enough evidence to continue moving forward, while an additional 77 are under review. Pinheiro has since been suspended, while Simonyan and Brunson have only been placed on administrative duty. The new video involves different officers, the public defender’s office said. The officers were not named. Melissa Rothstein, a spokeswoman for the public defender’s office, said the latest video shows a co-defendant of her office’s client. That person is not represented by the public defender’s office. Therefore, the office is not releasing the footage, she said. The public defender’s office said the related case that was dropped Monday involved seven officers, though Baltimore State’s Attorney Marilyn J. Mosby’s office has only referred two officers to the police department’s Internal Affairs division. Melba Saunders, a spokeswoman for Mosby, confirmed prosecutors had referred two officers to Internal Affairs, saying they “had questions” about the video. But she also urged caution in assessing the officers’ actions “as deceptive and/or a credibility issue” before a thorough review is conducted. However, even after prosecutors watched Pinheiro plant the evidence in the video, they still had him testify in another case, just days later. So, the idea that they are working toward the “advancement and pursuit of justice for all,” is laughable. “They had knowledge. They watched it and were appalled by what was on the video, and then for whatever reason made the choice to continue to call him as a witness,” said Public Defender Debbie Katz Levi. 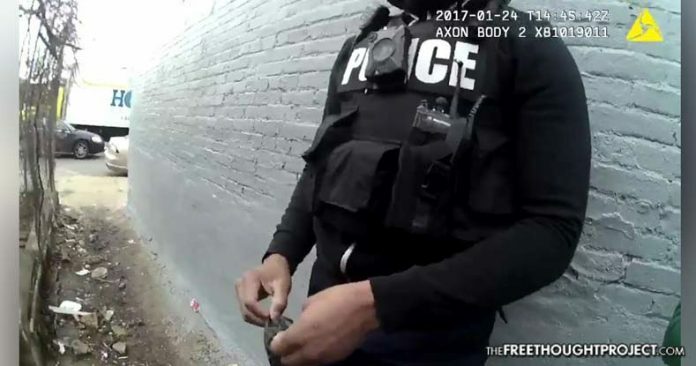 Exactly why he wasn’t immediately arrested and thrown in jail after being seen on his own body camera planting drugs to frame an innocent man remains a mystery. And now, the Baltimore police department is being tight lipped on this new video once again. Levi, who heads the special litigation section in the Baltimore public defender office, slammed Mosby’s office for a “lack of transparency” about the number of videos of concern that have been found, according to the Sun.